Yuletide Escapade is a larp for three days and two nights that takes place in a lovely haunted manor on a lake outside of Cleveland. It’s a time for Magischola students and faculty — from both Imperial and NWM — to kick back at the end of the semester and to get away from the academics. Unfortunately, magical mayhem tends to follow them wherever they go, so you can expect some creatures, extraplanar entities, ancient secrets, strange curses, and smuggled artifacts to appear. It’s a lower-key time to explore character relationships, hang out with friends, or get involved in the mysteries that unfold around the manor. For Yuletide 2018, Virginia Isle socialite and partymancer Calico Hathaway has invited an eclectic mix of people of all ages and means to party off the Penumbra. He was sad that the death of Morris Hayes meant that the annual Yuletide Retreat — much beloved of Magischola students as a fun and fitting end of the semester — had been cancelled. Ever one to fill the void, Calico convinced the Hayes family to rent the manor, and accessed his personal funds to recreate the shindig. What will be missing this year? The corporate overlords seeking to recruit promising students to a life of indentured servitude. What will replace the case study competition and the corporate sponsorships? A fashion show (feat. independent designers), a masquerade, a confection competition, and a renewed focus on the four Yuletide traditions of the Magimundi: the squirrel, the beaver, the ptarmigan, and the raccoon. Additionally, Calico attended both Imperial and NWM, and he hopes to ease the rivalry and animosity between the two schools. One love and all that. A Student at New World Magischola. I’ve never been to Yule. How is it different from New World Magischola? First of all, you’re not at school! So there are no classes, although some professors choose to give special lectures. You’re on a retreat with your friends! In the past, it was kind of like a study abroad program, with students and professors visiting Mishipeshu and interviewing with Foresight Enterprises for jobs after graduation. This year, it’s more of an end-of-the-semester party. Calico Hathaway, who was a substitute professor this past year, is renting out the vacant Punderson Manor for a laidback and artsy Holiday shindig. It’s designed to be the opposite of the corporate affair that Foresight used to throw. There will be opportunities for making and following your own plots, chilling with your housemates, and this year, doing cultural exchange between Imperial and NWM. Maybe Callimachans and Calisayláns are closer than they think? I’ve never been to a Magischola event. Is it going to be hard for me to join at Yule? Yule is designed to be a “one-off” event, meaning that its story begins and ends over the weekend. This year, there will be mixer-activities and Calico’s Collectible Card Game, which will encourage players to intermingle and get to know each other. While some players choose to play a character that has previously attended Magischola or will attend next year, and that character’s “head-canon” can include that they have been to the Yuletide retreat, a previous or subsequent character does not have an advantage regarding the weekend’s plots or festivities. All characters have equal access to the holiday events as well as the secrets and recruitment from the ancient Orders; there are no levels or paid privileges. NWM is a welcoming community and workshops before the game’s start help to integrate new players and their characters. In short, we love new players. They’re simply the best. Who is Calico Hathaway and why is he throwing this party? Calico Hathaway epitomizes everything the Magimundi loves and hates about Virginia Isle. He’s youthful, charming, passionate, a true scion of the Hathaway Family. He’s also a self-styled (and sometimes incredibly self-absorbed) partymancer who slacked his way through two colleges on a “Cryptozoology” degree, and who is said to flaunt his wealth and privilege for a good time to be had by all (so long as he’s having a good time), while taking little to no responsibility for his actions. Many who’ve met him either love him or hate him, but it has never been disputed that when he throws a party, it’s something to be talked about. As to why he rented out a likely Haunted Mansion for a party? It’s remote, it’s unlikely that Marshals presence will interrupt the festivities (even if his cousin’s already called them), and for all his faults he still understands that school is stressful, and everyone (some faculty included) need to unwind. By providing an eclectic camp-like calendar of events, there’s tons to do, and really not a lot stopping you. What can I expect to do at Yuletide? Yuletide, since it’s designed as not-wizard-school, has less of the tightly scheduled structure and feel. This means more freedom to do whatever you choose, as there are no classes or house points etc., but with less guidance of the student schedule. We set up a number of activities, from the whimsical to the severe, and players are encouraged to pick which things interest them. Opportunities for in character interaction with other players are not as constrained by which house and classes character’s are in, and faculty and students can hang out in an informal setting, without the pressures of grades and House Points. New players and characters to Yuletide will need to introduce themselves to others. Players and characters that have previously experienced Magischola will need to create opportunities to include these new players and characters. As always, all activities and plots are opt-in. If you’re perfectly happy lounging by the pool with your Shining Elixir, no one is going to expect you to stop and chase a dark wizard. Jack Slager is “Sir-Not-Appearing-in-this-Event” and if you don’t know who he is, then there is no need to find out. What is included in my $395 ticket (or my two for $715 ticket)? 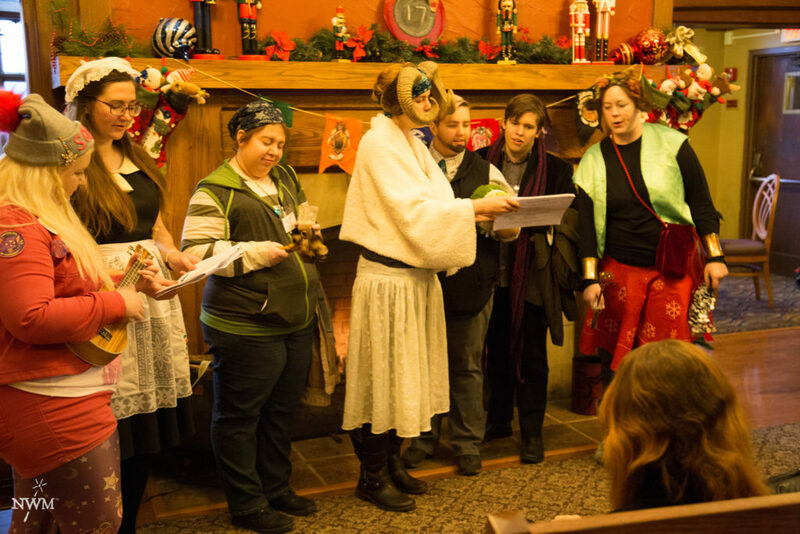 Yuletide Escapade is a 3-day, 2-night immersive role-play event at an exclusive historic manor lodge on the shore of a picturesque lake near Cleveland. We are able to rent the entire manor, which give us access to all the function spaces and the pool. Your ticket pays for catered buffet meals, props, scenography, photography, staff lodging and food, staff salaries, writing, game design, costuming, and production of the event. We do not include lodging (unless you purchased a VIP package) so that you can decide for yourselves who you want to room with, and how many people. See more info about lodging below. What are the lodging choices for Yuletide? Punderson Manor’s rooms have a private bath, two double beds, and can sleep four. Some rooms also have a set of bunk beds in the wall, and will sleep six. Manor rooms have doors between rooms, which can be opened to create a suite-like feel for celebrations. There are also cabins a short walk from the manor. All cabins have two bedrooms, a kitchen, and a living room. Bedroom 1 has a queen bed. Bedroom 2 has either a double/single bunk (double bed on bottom, single on top) or two sets of single bunk beds. It is possible to have someone sleep on the couch and the living room is large enough for an air mattress. Per contract, all manor rooms must be rented before cabins may be used. If you have already rented a cabin and there are manor rooms remaining, you will be asked to move to the manor. Advantages of being in the manor: you don’t have to put on your coat, hat, and gloves to walk to the manor for meals and roleplay, or back in the evenings to go to sleep. Advantages of being in the cabin: you have more of an intimate feel for a “house party” and have fewer noise restrictions in the wee hours. How do I book my lodging? To book your room or cabin, call 440-564-9144. Give them the “Learn Larp” group reservation code, which will get you the negotiated discount rates. Manor rooms are $99 per night, plus a $2/night technology fee and 12.75% taxes. Cabins are $169 per night, with the same tax rates and the $2/night technology fee. You may share a room or a cabin with whomever you wish. What should I bring for Yule? A warm coat, hat, gloves, and shoes that can cope with snow. Festive clothing. Wizards like a tacky Yuletide. An outfit for the fashion show? Fun pajamas for hanging out. Wizards seem to love funsies. And flamboyant dressing gowns. Why did you change Yule? Yule as an event has evolved over the past few years. It was a Wendigo hunt/Professional development conference, then a murder mystery, now a celebration. In order to not repeat or run the same sorts of events at Yule we thought that changing things up will add a bit of Holiday spice to the mixture. We also received some feedback that Yuletide felt too Christmas-centered, which was off-putting for those who do not celebrate Christmas. As a result, we took a hard look at ingrained secular Christian customs and sought to diversify the design. Yule has always been a bit of brighter event to look forward to as it gets colder and darker outside, drawing on the holiday’s pagan origins around the solstice. Our goal is to retain the holiday cheer, but to make it more Magimundi! We are also trying out new things so that we can continue to grow as a company and see what works for our players and what doesn’t.